Home > Community • Pay By Weight > ONLY 1 WEEK LEFT!! 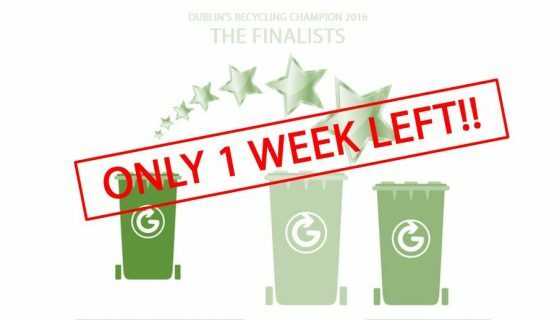 There’s only 1 week left in our 2016 Recycling Champion Competition and the heat is ON! We are currently monitoring the bin weights of Denise Scully from Cherry Orchard and Margaret Dunlea from Inchicore. The objective for both is to legitimately move as much waste as possible from their black bins to their green and brown bins. Next week, one of these lucky contestants will be crowned Dublin’s Recycling Champion 2016 and will be the recipient of €1,000 AND a 3 month supply of Obeo food waste boxes! Do you have any tips you’d like to share this week? Find this post on Facebook and post your tips in the comments. Use the hashtag #littlegreentips so we can find you!